Just when you thought it couldn't get any brighter, Planet Bike has improved the immensely popular SuperFlash Rear Light with an impossible-to-ignore Turbo pattern. Best tail light on the market. Provides wonderful visibility and mounts easily. 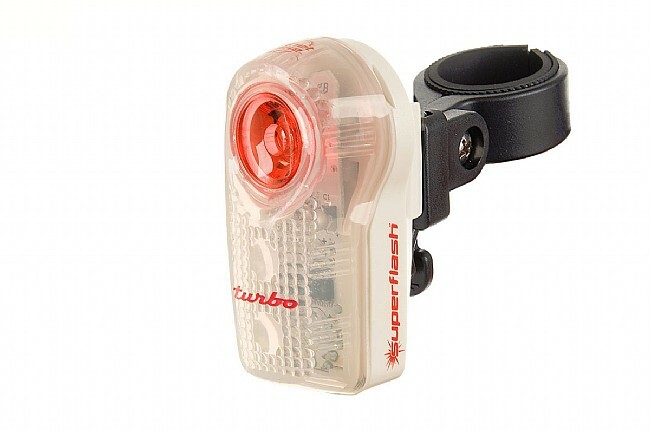 The Planet Bike Superflash Turbo one of the best tail lights on the market. A buddy had it on a ride and was the brightest light out there. Can't say enough about WesternBikeWorks, I purchase almost all my bike stuff through them now. Thanks!!!! Wildly bright flasher, like using it for commuting, worry it might blind riders behind me, but I feel safer in traffic. I use it now riding during the day, if riding through tunnels or for late rides running into twilight. Only think I don't like is the clip is on the loose side and the light doesn't stay put on my saddle bag without using a rubber band. That seems cheap. I have a Light and Motion tail light that has a bomber attachment. Quick & easy to correctly install & operate and you really can see it's superflash a mile away. This is a high quality bike lite. I have many different el cheapo units that I still use. This Turbo light is real easy to switch from bike to bike, so the older lites will be phased out & sold the flea mkt. soon. The visibility factor is awesome. 1st time out training with the club I was obliged to ask if it was OK to leave it on while in the pace line, (it's really that bright!). Nobody was annoyed & they actually appreciated its use because the turbo flash makes the whole group more visible to passing motorists. Great light, super visible. Not sure how long the battery will last. Would like to have had a USB recharge on it. Good value. Easy to mount and removable from mount when not in use. Used it for 3 seasons no problems. Would not use less than a 1 watt. I have the older version of this light on another bike, but this one blows the other out of the water!! Very bright indeed!! It will definitely get the attention of anyone behind you, for sure!!! This light is very bright and easy for others to see. The random flashing pattern enhances the visibility. A must if you ride with traffic. All my riding buddies ask where they can get one like this. This light is very visible and bright especially if you ride at night or in rainy weather. Must be good, somebody stole it right away. I have had several and it is hard to beat the combination of brightness and light weight. Working well. I have one on each side of my chain stay. I commute to work in the dark. I'm a big believer in being seen when riding. I've been using both the 12 watt and more recently the brighter 1 watt tail lights for over a year and I've not had a single close call or altercation w drivers. Of course I follow traffic law and use common sense - cars always have the right-of-way Better alive than right -) Esp. the Turbo, 1-watt version really get's drivers' attention. Again using plenty of common sense and courtesy, w this light on, cars give me plenty of space as well as let me merge into turning lanes wo hassle. The only reason for the 4-star is that one of the units ( I own 3 of these ) came apart when I went over a pot hole. The one half the unit separated from the unit spilling batteries which I had to scrounge around a blind curve to locate. I put a piece of electrical tape to avoid the problem. Other than that I highly recommend it. The brightest, most blinding light I've ever seen! It might even make the Bozos who always hang on my rear wheel move to the front! Perfect! Use in early morning and when returning at night from rides. On off switch is very stiff. High-quality product and imperative for safety. This taillight is amazing! I've been several hundred yards past a roadsign and turned around to actually see it reflect off the sign! The flash pattern this light uses is sure to get a drivers attention. Most drivers actually pass me in the far lane now instead of 3 feet away. Don't look straight at it! Seriously, up close this thing could practically induce seizures. Nothing can stop cagers from being idiots, but if they hit you with this light on your bike, they will have NO excuse. On the random blink setting, you can probably see this light from 14 mile away. So far so good riding two lane blacktop in Mineral County Colorado. Batteries last very well, not quite as bright as rechargeable but less trouble.